An image of two frightened figures in white, emphasising their innocence. The man and the woman with eyes full of horror are pressed to the ground, behind bushes that barely hide or protect them. Their eyes show immense fear, they have lost everything and have no idea what will unfold. In the distance, flames can be seen rising from their homes, whirling up into the starry night sky. Invaders can be seen killing anyone unable to endure the long and cruel road to the slave market. The power of the scene is also in its location. Both figures are located at the bottom of the monumental painting, measuring six by eight meters. The viewer has such a desperate view of “Slavic Adam and Eve”, almost at eye level. The Slavs in the their original homeland: Between the Turanian Whip and the Gothic Sword is the first image in Mucha’s monumental series. The scene is dated to the period between the third and sixth centuries AD and placed somewhere to the east, within the Slavic homeland. 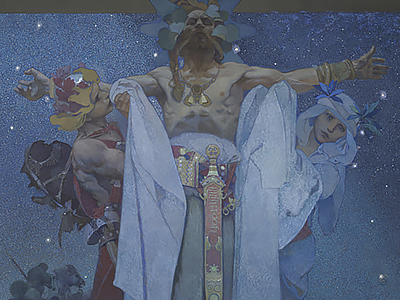 While other paintings may more or less faithfully capture different historical events, Mucha was able to express himself more freely and fill the work with a series of symbolic references. The name of the painting outlines the position in which Slavic tribes were at the time of the migration of nations. Ahead of them, to the west; Goths and Germans, and to the east; Turanians and Central Asian nomads. The message hidden in the picture tells us that in the future, the Slavs will face a fight for their freedom. It is just before the Balkan wars, the conflict which saw the Turks expelled from the Balkans. The newly established Slavic states of Bulgaria, Serbia and Montenegro sought to gain the largest territory at the expense of the Ottoman Empire, which has recently gained independence. Their efforts supported by the Russian Tsar. The struggle of the Slavs for freedom is in full swing. The most interesting part of the picture is, however, the floating trio to the right – the most prominent figure being the pagan priest in the centre, who prays for mercy for his enslaved flock. Beneath his left hand is a girl with a green wreath, a symbol of peace. While under his right hand, a young warrior representing a just war. The image of ‘The Slavs in Their Original Homeland’ was completed in 1912 as the first in The Slav Epic cycle. However, the foundations for Mucha’s work were created long before this. Already in 1898, Mucha had made his way to the Balkans, at which point the first plans for his future work were created. Another foundation for Mucha’s masterpiece was laid when he carried out work at the Pavilion of Bosnia and Herzegovina for the World Exhibition in Paris, in 1899. Mucha was a highly sought-after artist at this time, both in Paris and New York. Yet, his idea of the Slav Epic prevailed. In 1910, after a quarter of a century abroad, Alfons Mucha returned home. At the Zbiroh Castle in western Bohemia near Rokycany, he started work on The Slavic Epic. Mucha won the support of Charles R. Crane, a Chicago businessman. With Crane’s financial support, Mucha was able to close himself in the main hall of the castle, leased from the Prince Colloredo-Mansfeld, and fully devote his time to painting. At the end of 1912, Prague took possession of the first three paintings of the magnificent work. The Slavs in their original homeland being one of them.